This blog is meant for Padmanayaka Velama Community. 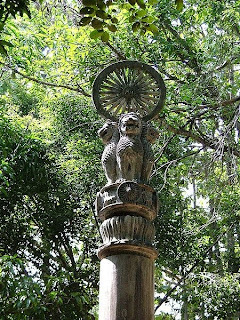 Only original Ashoka Pillar with Lion Capitol and Dharma Chakra on top of it, known to be intact till today and not damaged by invading forces later on subsequent to Ashoka's rule from Pataliputra. Later on Indian government adopted the Lion Capital as its National Emblem and the Dharma Chakra ( wheel ) on top of it ( and also found elsewhere ) incorporated into Indian National Flag. If you wonder why this pillar is not damaged, it is simply because it is one of those erected outside India by Ashoka the Great, in one of the present Buddhist countries, to propagate Buddhism during the era of Ashoka the King.